6th Grade Math Club Copa After School 3-5 p.m.
HS Tutoring-Rm 34 (R. Cruz) 3:00-5:00 p.m. Interested in seeing if our schools are a match for your family? Contact us for a personalized meeting and tour with our superintendent, Dr. Meier! During the 2017-18 school year, the entire district staff embarked on a mission to revitalize the district by adopting a new overarching strategic plan to unify and provide common direction for the district’s elementary, middle, and high school. After exploring future trends for the year 2030 and beyond, analyzing student, community, and staff surveys and input, the staff cooperatively arrived at a focus on future Technology, Engineering, Arts, Mathematics, and Science (TEAMS)! This will help our current and future students to be prepared for participation in a changing global economy that extends far beyond the boundaries of their local community experience. A Visioning Task Force (teachers, classified staff, parent, administration, Board member) was assembled and met for two full-day meetings to discuss the TEAMS concept. 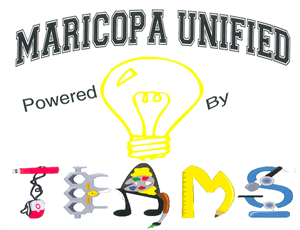 The task force decided on a motto of, Maricopa Unified School District-Powered by TEAMS to guide, the T.E.A.M.S. approach. The Task Force developed a draft strategic plan based future trends to meet the needs of students and the community for the year 2030 and beyond. The Task Force reviewed, evaluated, and modified the district’s Vision, Mission Statements, and Tenants with the new TEAMS focus. Maricopa Schools are TEAMS of adaptive learners, ready for future challenges and careers. Using Technology, Engineering, Arts, Mathematics, and the Sciences (TEAMS), our students will solve real-world problems. Through project-based learning, students are engaged, self- motivated, and self-directed. Students will gain technical expertise, balanced with collaborative communication skills to meet the everchanging demands of the future. Staff are facilitators in learning to support student achievement in all curriculum areas. Staff enhance technology competence by working with students to design high content, engaging, and satisfying student work. This supports the project-based learning involving TEAMS philosophies. Staff provides opportunities for students to create learning interests through content curriculum integration and connections. The mission of the Maricopa Unified School District is to work in partnership with parents, students, and the community to provide an increasingly rigorous educational program. A caring and nurturing environment of belonging, promotes self-motivation, self-efficacy, and lifelong learning that will prepare students for the academic and technical expectations of higher education and industry. Students will be self-motivated and excited to research and apply subject knowledge through innovative Technology, Engineering, Arts, Mathematics, and Science (TEAMS) teaching strategies. Students will receive a personalized support program to ensure success in core curriculum content and future career exploration. Students are encouraged to apply critical thinking skills to identify and solve challenging real-world problems to meet rigorous state standards. Students will foster different types of learning modalities to build intelligence and be well-rounded intellectually. Students will collaborate, express, and defend ideas using a variety of different communication techniques in a TEAMS environment. Students will be challenged to manage materials and be prepared to take ownership of their own learning, strategically and intentionally, to become self-directed learners. Students will progress through their educational career with the knowledge and practical experience to be successful for college and future career/life choices. Students will be accountable for their learning and actions to become self-reliant and self-motivated life-long learners. Maricopa is a city in Kern County, California. Incorporated in 1911, Maricopa is located 6.5 miles (10 km) south-southeast of Taft, at an elevation of 883 feet (269 m). Maricopa lies at the junction of Route 166 and Route 33. The Carrizo Plain is located to the northwest, and the enormous Midway-Sunset Oil Field, the third largest oil field in the United States, is adjacent on the north and east. With only a Shell gasoline station, Subway sandwich shop, Maricopa Inn motel, post office, Head Start preschool, and a Kindergarten-12th (K-12) grade school, Maricopa is a small city in the southwest San Joaquin Valley, which retains its rural country flavor. The city has a total area of 1.5 square miles (3.9 km2), all of it land. Maricopa is in the extreme southwestern corner of the San Joaquin Valley, on the first rise of land into the foothills of the Coast Ranges, and the Temblor Mountains. The San Andreas Fault runs northwest and the San Emidio Mountains run southeast of Maricopa. The climate of the area is hot and semi-arid, with summertime temperatures routinely exceeding 100 degrees Fahrenheit. Freezes occur in the winter, with the mean period without freezes being about 275 days. About six inches of rain falls annually in Maricopa. External Webpages: Whenever this website includes links to external web sites the district is not responsible for the content of external web sites. Webpage Accessibility: This website is being modified to increase the accessibility for persons with vision, hearing and/or mobility limitations. All content on the website may be obtained by contacting Scott Meier, Ed.D. at the District at 661-769-8231 ext. 202. Content will be made available in various forms to meet the limitations experienced by the requesting person.